Four of the six scholarship winners are pictured above (from left to right): Nicolas Coker, Kylie Harmon,Alyssa Varanoske and Nicholas Clark. Not pictured are Erica Goldstein and Cheyanne Frosti. 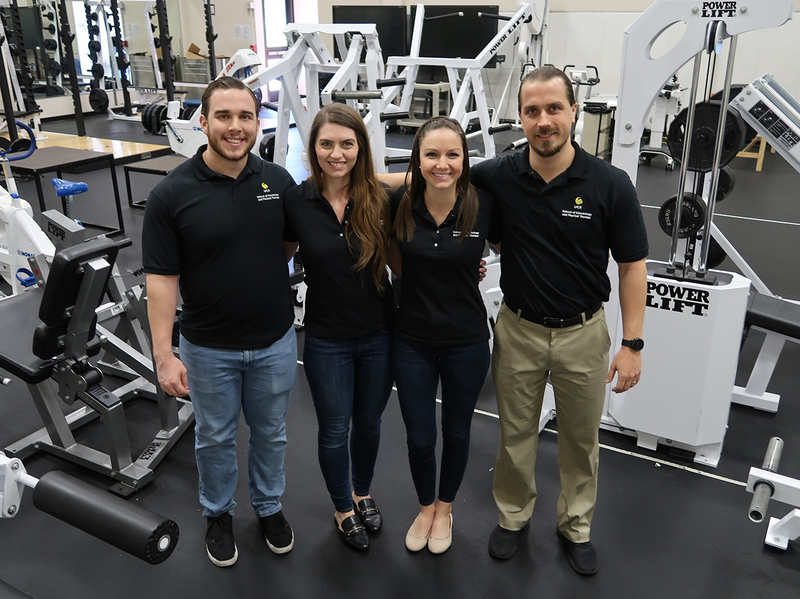 Six students in the School of Kinesiology and Physical Therapy have each won a $1,500 scholarship from the National Strength and Conditioning Association Foundation. Nicholas Coker, Nicolas Clark, Kylie Harmon, Alyssa Varanoske and Erica Goldstein are students in the Exercise Physiology Track in the education doctoral program. Cheyanne Frosti is studying for a master’s degree in sport and exercise science. The National Strength and Conditioning Association offers a variety of scholarships for students who are current NSCA members. Applicants must submit three letters of recommendations, a current resume, transcripts and an essay. Field certification, community involvement and contributions to the field of strength and conditioning also were taken into consideration for the awards. Coker and Goldstein received the Challenge Scholarship, which is awarded to an undergraduate or graduate student seeking a degree in strength and conditioning-related fields. Clark received the Minority Scholarship, which is awarded to ethnic minorities as determined by the U.S. Census Bureau to encourage minorities to enter the strength and conditioning field. Harmon, Varanoske and Frosti received the Women’s Scholarship, which is awarded to women to support and encourage interest in the field of strength and conditioning. Varanoske said that it is important to have women represented in the strength and conditioning field. She also said that attending UCF has provided her the tools and resources to compete for the scholarship.